varndell is quality, v unlucky not to be going to NZ but hopefully he can show off the Churchill Cup! I love Leicester, and Varndell is a freak (in the good sense of the word). His problem is he's defensively weak, and sometimes his positioning and reading of the game is well below standard (quite bizarre for a professional athlete, who has all day to work on his weaknesses). All Leicester wings seem to have this problem, actually (Tuilagi, Varndell and Rabeni; BUT they are athletic monsters). I understand why Varndell is not in the squad to tour New Zealand, but he should be in the full England squad, to work on his weaknesses. He is a proven matchwinner, and can turn a game around on his own. my brother has varndell's boots. sander, have to disagree with you there, i've watched most of leicesters home games this season and a fair few away games, and his defence is vastly improved. I've not seen him miss a tackle this season, and his positional play is far better now - loffreda seems to have taught him how to maintain his concentration now for the full 80 minutes. Admittedly in previous season he WAS a liability, but he has worked really hard on his weaknesses. 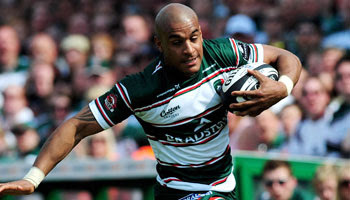 In my opinion he will be 1st choice wing come Autumn internationals.